After 8 years of dedicated service for the International Network for the Availability of Scientific Publications (INASP), Peter Burnett has decided to finally call time on his career come January 2016. Burnett worked as Head of Library Development for INASP for 5 years and has for the past 3 years been working for the network as Programme Manager for Library Curricula and Network Management. But for the past four years, he has been a regular figure within UbuntuNet Alliance as he has been INASP’s symbolic figure in the network engineer capacity building programme which UbuntuNet Alliance holds in partnership with the Network Startup Resource Center and INASP. Under this programme, Burnett has been to the last four UbuntuNet-Connect conferences and INASP has supported 2 network engineers from three UbuntuNet Alliance NRENs of ZAMREN, RENU and TERNET to attend the past three UbuntuNet-Connect preceded network engineer training workshops. INASP has also been supporting engineers from the three NRENs to attend African Network Operators Group (AfNOG) training workshops since 2013. Speaking to NUANCE at the UbuntuNet-Connect 2015 which is set to be his last UbuntuNet-Connect conference where he will wear the INASP tag, Burnett singled out INASP’s involvement with UbuntuNet Alliance as the most exciting programme he has been involved in at INASP saying UbuntuNet Alliance’s core function of providing connectivity to NRENs as well as that of providing training to network engineers has augured well with the main objectives of INASP. The former University of Oxford Head of Technical Service also took time to hail INASP’s impact in making sure that low income countries are able to negotiate for discounted or even free country wide subscriptions for journals from major electronic publishers. INASP was founded in 1992 by the International Council of Science following a report that hinted on a lack of scientific output from Africa. Currently, INASP is working in at least 23 low income countries worldwide 13 of which are in Africa. Among other developments, INASP managed to establish the Africa Journals Online in 1998 and the network has been involved in the training online editors in managing online journals. 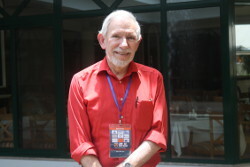 UbuntuNet Alliance has enjoyed working with Peter Burnett and wishes him continued good health after his retirement.